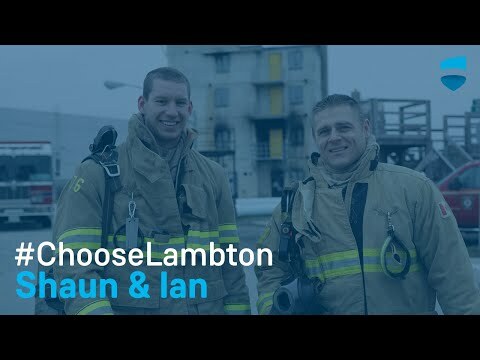 Shaun Henderson and Ian Van Reenen are firefighters at the Oakville Fire Department but that isn’t all they have in common. The two Lambton College graduates have travelled very similar paths from the days of sitting in a classroom to their career as full-time firefighters. Henderson’s educational journey began about 10 years before Van Reenen’s. Even though Henderson came from a family of firefighters, he didn’t consider it a career option until he was in his late teens. For Henderson, he knew he wanted to be a firefighter after joining the volunteer fire service in Corunna, ON at the age of 18. So he applied to Lambton College. Van Reenen had always known he wanted to be a firefighter but wasn’t sure if it would be possible for him considering how hard it was to get into the program. But after looking at some other options he decided he would just have to go for it, and he applied to Lambton College. The two firefighters wouldn’t cross paths until they both discovered their passion for the Scott FireFit Championships. Henderson joined the FireFit team shortly after he started working for the Oakville Fire Department. Van Reenen was introduced to the competition on the first day of class when a professor talked about the team. “I decided to show up for practice one day, and then I just kept showing up,” said Van Reenen. Today, both Henderson and Van Reenen have won numerous titles and continue to compete together on the Oakville FireFit team. Henderson had the fastest time in the world in 2013 and Van Reenen currently holds the World Record for the Scott FireFit Combat Challenge. Although winning is a huge factor in why the FireFit Championship is so much fun, it isn’t the only reason Henderson and Van Reenen enjoy the competition. "It’s hard, heavy, hot work and it’s not easy. The whole point of the challenge is to keep firefighters fit so they can serve their communities better." The team also builds a comaraderie that is seen not just on the FireFit team but also within the group of firefighters that work together day-in and day-out. Henderson says being a firefighter is a lifestyle. Your co-workers are your friends; your families get together; the workplace extends far beyond the fire hall. For Van Reenen, this lifestyle is why he loves being a firefighter. It’s imperative that the group of firefighters be a tight-knit community because they never know what kind of situation they’re going to be in. Firefighting is about problem solving and when they arrive on scene they all bring different strengths to the situation.